ATM includes LAN (Local Area Network) and WAN (Wide Area Network) network and established connection-oriented connection. 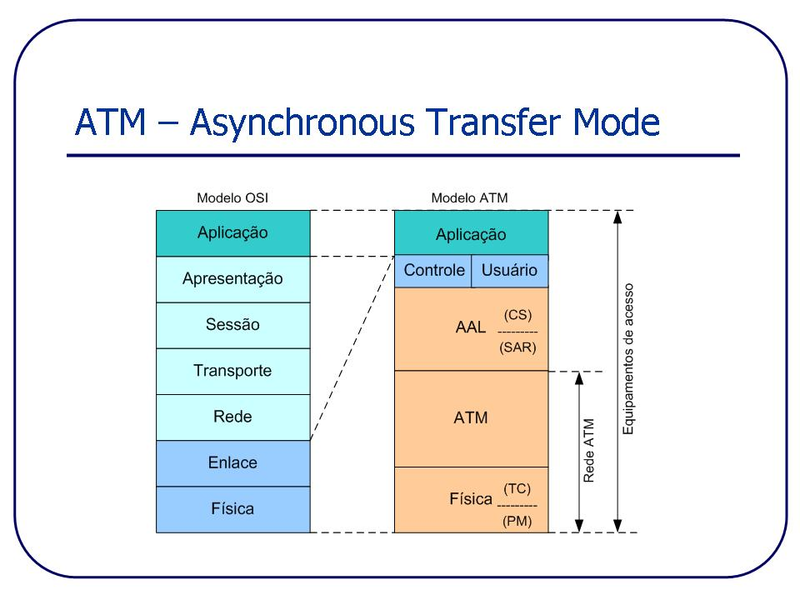 ATM is a connection-oriented packet transmission technique widely used in existing telecommunications networks to provide voice, video and data. ATM applications fixed-size data packets called cells, which is 53 bytes long and have a header is provided with a connection identifier. The connection identification makes it possible to support multiple point-to-point connection to a single physical ATM connection. The ATM switches in a network connection to send the identification number of each cell to the next hop. ATM provides a highly complex technology, with features intended for applications ranging from global telecom networks to private local computer network. With ATM is a partial success as a technology, with a wide distribution, but generally only used as a transport for IP traffic.